Welcome to Day 4 (ahhhh where has the time gone?!) of the 2017 Pumpkin Week! Hosted by Terri from Love and Confections, 31 Bloggers will be sharing 106 pumpkin-filled recipes over the course of the week. Be sure to come back every day to see all the delicious creations - from muffins to cakes, cocktails, breakfast baked goods, savory pastas and stews, and gluten-free recipes too. You can also find these great recipes and more on Love and Confections' #PumpkinWeek Pinterest Board! I'm struggling with how to even describe this... It's really something you might imagine as a panini, but with a thinner package. 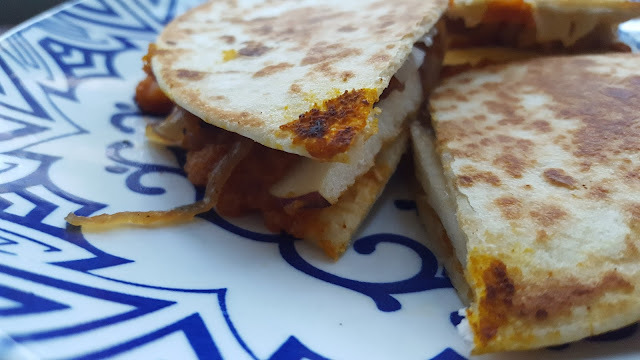 The pumpkin is lightly sweet and spicy, the apple adds wonderful crisp and sweetness, the caramelized onions are the icing on the quesadilla, and the cheese sort of just holds it together and because cheese. I mean what more excuse do you need to add cheese (you could skip it and keep this vegan though). I absolutely loved this combination of textures and flavors. It was unique and certainly memorable. 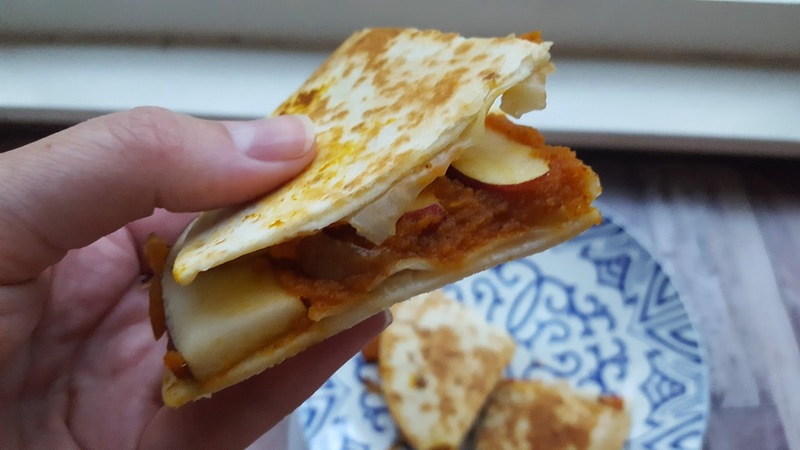 There are a whole bunch of variations you could try - I could easily see making this a pumpkin pie quesadilla with just the apple and pumpkin puree (but spiced with syrup and cinnamon) and then dipping in a little whipped cream for dessert. Yumm. Heat a medium non-stick skillet over medium to medium-high heat. Add onions and broth, stirring occasionally until they begin to caramelize. Reduce heat if needed to prevent burning. Add additional broth if desired. Continue cooking for about 30 minutes, until onions are soft and browned. Meanwhile, combine the pumpkin puree with the maple syrup, chili powder, paprika and salt. Set aside. When onions are ready, heat a large flat skillet over medium to medium high heat, sprayed with nonstick cooking spray. Lay one tortilla down, and one thin slice cheese on top. Divide pumpkin mixture into fourths, and spread over cheese, top pumpkin with 1/4 of the onions, 1/4 of the sliced apple, top with one more thin slice of cheese and a top tortilla. Cook 2-3 minutes per side or until crisped and browned, and cheese has melted. Remove to a cutting board, cut into fourths and enjoy while hot! Pumpkin Streusel Bar from Cookaholic Wife. 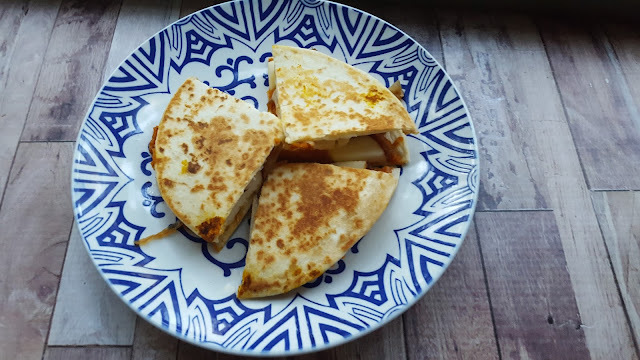 Ok, these look amazing and I love the idea of dessert quesadillas as well. We could make a complete quesadilla meal.